Bollywoo: All Eyes on Dabangg! With the mega flop We Are Family out of the way, all eyes are now on the most eagerly awaited film of the year. Dabangg, set to release this Friday (September 10), has been making waves for quite sometime with its interesting promos and incredible tunes. There hasn't been such hype about a film in an incredibly long time. It is expected that the film will take an extraordinary start. It might be safe to say that Dabangg will be the biggest hit of Salman Khan's career and his first film to cross the 100 crore mark in collections. Sonakshi Sinha looks dazzling. I don't think there's been so much buzz about an actress in the industry prior to a debut release for quite a while. Salman Khan has sported a mustache in the film and I must say he looks very good with it. Munni Badnam Hui is the item song in Dabangg. Usually, when promos are put together an item number is the biggest song of the film and used extensively for promotion. In the case of Dabangg however, Munni Badnam Hui wasn’t used in the promos till much later. Tere Mast Mast Do Nain and Udd Udd Dabangg mystified us with the very first promos of Dabangg many weeks earlier. Another superb track is Chori Kiya Re Jiya, this sweet love song is sung by Sonu Nigam and Shreya Ghoshal. Even Humka Peeni Hai has become some what of a crowd favourite. A powerful soundtrack, amazing promos and a promising star cast, looks like Dabangg is already on its way to becoming the biggest hit of 2010. I'll even be as bold as to say that Dabangg will go on to become the biggest hit of all time, breaking the record set last year by 3 Idiots. 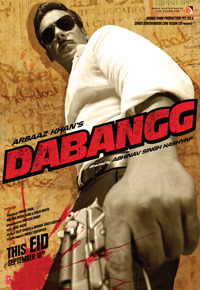 Dabangg is sure to give you a bang for your buck.